They are – still ­- the heartbeat of communities. But these key features are few and far between in the Royal Docks community now. It is incredible the number of public houses that have vanished in our area. But the tide is about to turn. Three new pubs and bars could be soon about to adorn the area’s landscape again. One statistic is a real eye opener in our story of lost pubs. 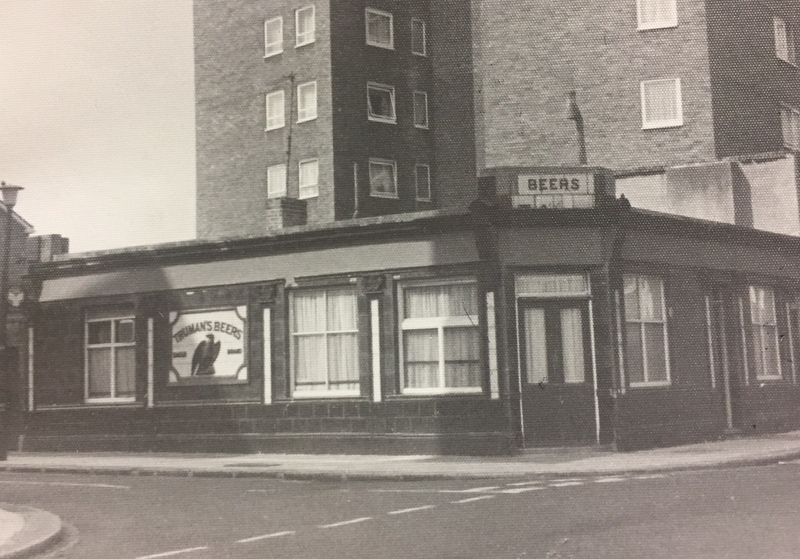 Since the 1970s, 53 pubs have closed in the E16 Royal Docks postcode area, made up of Silvertown, North Woolwich, Custom House and Canning Town, and 18 of those have been in the last 18 years. It is a trend replicated in Newham as a whole, with many now becoming betting shops or mini supermarkets. 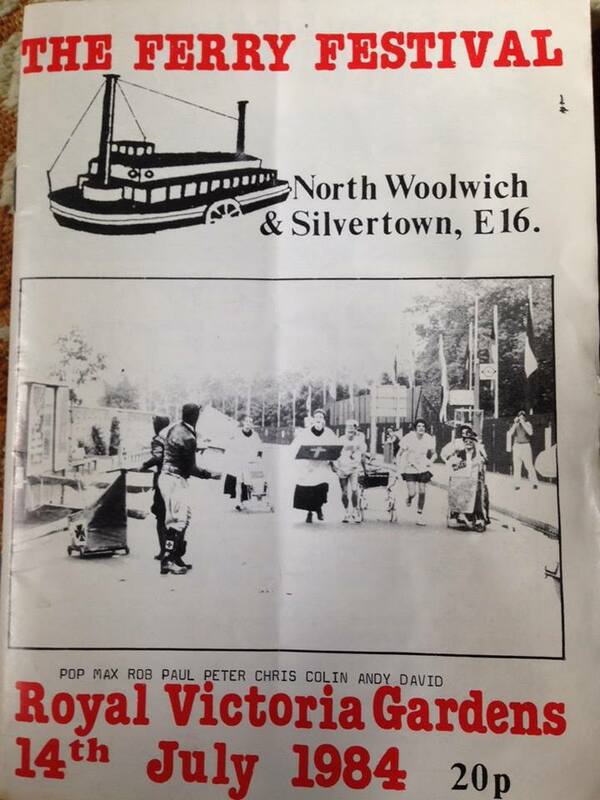 Of the 26 pubs we once had in Silvertown, West Silvertown and North Woolwich, only three remain. 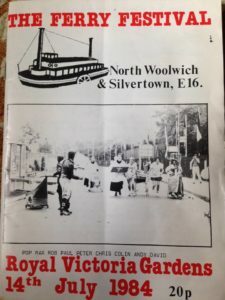 In the heyday of the community Ferry Festival in the late 70s and early 80s, there was a pram race featuring stops at public houses in North Woolwich and Silvertown. Ten pubs and many laughs. Sadly, if the organisers of the new Ferry Festival – reborn last year – held a pram race today, the entrants would be travelling between just two pubs now. Only the Henley Arms and the Royal Standard survive. The Ram remains in West Silvertown. But the pubs that have vanished have given us some legendary tales as this little trip down memory lane will hopefully recall. Today we celebrate the history, heritage and golden memories. Generations of dockers and their families and residents of the Royal Docks communities kept those pubs going throughout their good and bad times. Pub life has always been so important. Having a drink at lunchtime and then returning after work is still a tradition for some. Loyalty is also important. Having your own local and even having your own pint mug behind the bar was one of many things making it the centre of social life. The beanos to Southend or similar seaside haunts was a tradition for generations of drinkers. A lot of the community contact has gone as a result of the fall in pub numbers. The pub is traditionally a place where you can air your grievances, moan and groan about life and then be cheered up by friends. If you had lost a job, you might find another through the pub. It’s another reason why we need to protect and cherish those that are left, and encourage all those who want to bring back our beloved boozers. Lesley Quirk, 61, said a number of boozers were a “home from home” for her lorry driver father Tom. “Every spare second he had he would spend down the pub. It was the tradition in the 60s, 70s, 80s and 90s. More so than now! 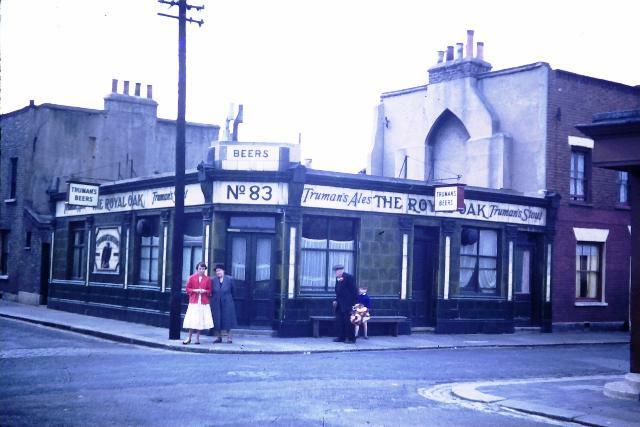 Among Tom’s watering holes were The Ram, the Pitts Head, Streeties and Royal Oak in Canning Town. There were no meals in pubs then, perhaps a few roast potatoes on the counter and seafood being sold in a basket by vendors or outside from a stall. Jewellery , records, video tapes, there seemed to be a never-ending supply of goods , along with cigarettes from the nearby Phillip Morris factory. Not all deals went right though. Tom once came home with a box load of shavers he thought he and his son in law could make a few quid on. They turned out to be returns sent back because they were fault. They went straight to the council dump. The Graving Dock Tavern in North Woolwich Road, West Silvertown, built in 1867, rebuilt in 1960 rebuilt by Watney’s Brewery in 1919 as an ‘Improved Public House’ at a then huge cost of £19,900 and then closed in 2005, is probably the worst example of blight on a pub. This was forced, along with neighbouring businesses like Leverton’s Fork lift trucks, to close by the London Docklands Development Corporation. I went to my auntie’s work ‘leaving do’ there. Nothing has happened to that land in the ensuing 13 years. It has been left to rot, when, like George’s diner and café next door it could have stayed open to the thousands of people who now live in the riverside homes opposite. I am sure it would also have been used by the thousands of workers building the new homes, and the new community that has been created. Tragic. 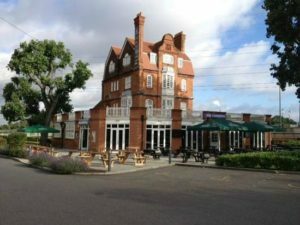 The Tavern was situated in North Woolwich Road. 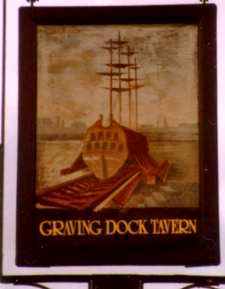 A graving dock was a dock used for working on the hull of ships. Tragically it still stands and could have been used. Sue Macpherson worked for a shipping company and spent most lunch hours there. 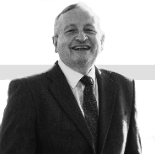 Bernard Murphy worked at the Millennium Mill in Silvertown as did his father for any decades. “It was always packed with dock workers at lunchtime.” Barbara Laws played darts there. I have a memory of the pub which I thought time has clouded but Cliff Sealy remembers the layout which oddly had a saloon bar and public bar, with an off licence for off sales in between the two! 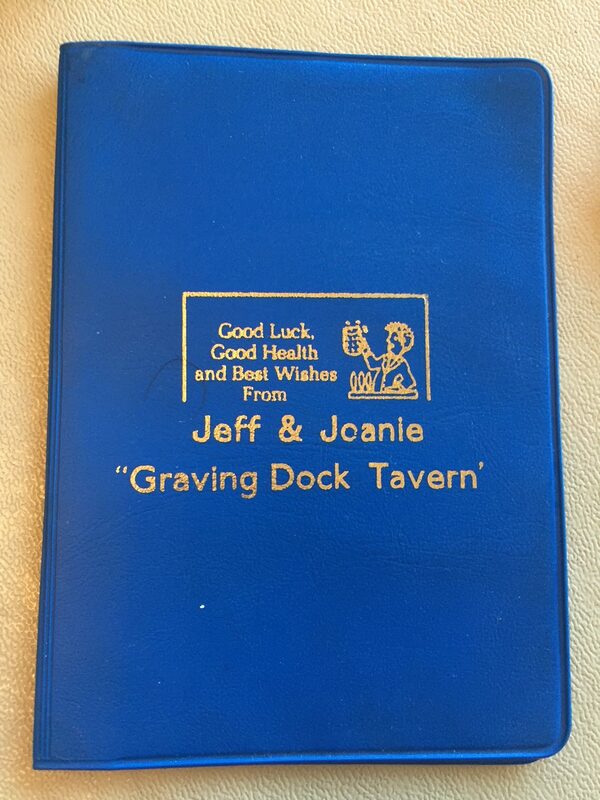 The pub, like many in the 70s, 80s and 90s, gave regulars diaries to say thank you for their custom and remind them where to drink! Terry Marrison lamented loss of the Huntingdon Arms in Canning Town. Catherine Finlayson said her grandad used to play the piano in the pub. 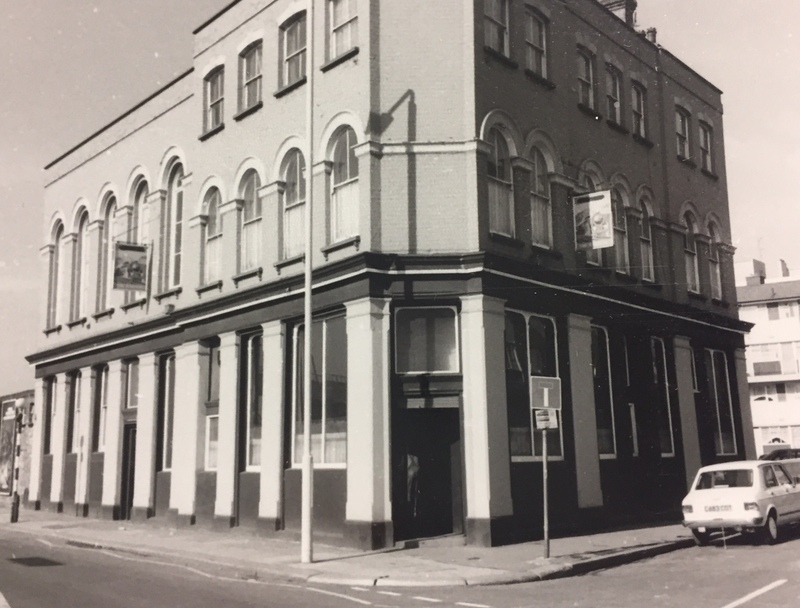 The Three Crowns in North Woolwich has special memories for many. 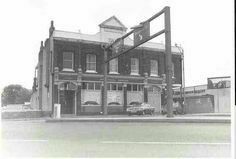 Kevin Jenkins, founder of charity Ambition, Aspire, Achieve, said the pub in the 70s was one of the few places you could play bar billiards. “They also had dart boards and also special boards with the ‘fives’ game it, “said Kevin. 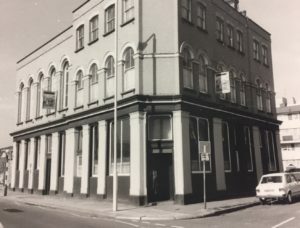 I have my own memories of the Three Crowns in Pier Road near to the Ferry Approach, where, when you came out of the loos you thought you were drunk even if you hadn’t touched a drop, as the floor sloped downwards! Many groups played there and the atmosphere was always good. We held a surprise silver wedding anniversary party there for my parents, a great night. Sadly, not long after, my mother Lily passed away after falling down the stairs of The Lion pub they were running in Stoke By Clare in Suffolk. Cliff Sealy remembers many Beanos from the Henley. “The pub itself was brilliant, and still has that spirit now. 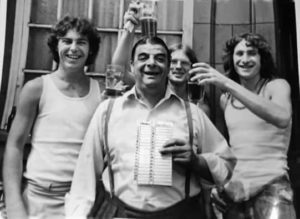 But not only the pub itself, but the away days it fostered, the beanos to the seaside, were brilliant..
Clliff also said there were great bands that played in The Crowns and the Royal Pavilion, said Cliff. Alan Morris said he was in the Crowns every night in the 60s and 70s. It only took you about 50 steps to walk between the two. The two were among the pubs featuring in the famous pram race in the Ferry Festival. The race started at Royal Victoria Gardens park and then went up to the Royal Pavilion to the Three Crowns, then a sprint along Albert Road the Royal Albert, then turned back to Kennard St. Community Centre, The Henley, then another long sprint to the Royal Standard then down Woodman Street and to the Royal Oak, down to the California, up to the Roundhouse then back to the finish at the starting line. The Royal Pavilion, known to many locals as The Pavi, is now being developed into a block of flats, and has a superb view of the River Thames. It was known by locals as the venue for many live bands and singers. It figured in one of the Royal Docks greatest tales from the past, when a giant whale was washed up on its shore in 1899. But moving forward into the 70s, it was rumoured to have a ghost. The Pavilion was in Pier Road and Davina Dupey takes up the story. “My uncle Ron Slight and aunt Eileen had the Pavi from 1976 to1986. It was a Grade 11 listed building but sadly was demolished after they had left. “The pub was haunted by a ghost called Fred. My aunt said he often protected her also he stopped a record that one of the barmaids was repeatedly playing at Christmas. The next day the record could be played ok.
“My aunt said the North Woolwich Ferry Festivals were the best of times. Like a carnival with games and especially the pram race. Rosemary Head speaks with fondness about the Beanos for women from the Prince of Wales pub in Prince Regent Lane, Custom House, particularly the trips to Southend, in the 60s and 70s. The pub closed in 2002. One particular trip in 1961 was memorable. “We stumbled across various things left over from the festival. It was a great day out. We took the community spirit from the pub with us. In West Silvertown, the ladies also loved their Beanos. A lovely picture emerged from the early 1950’s from Stan Dyson. 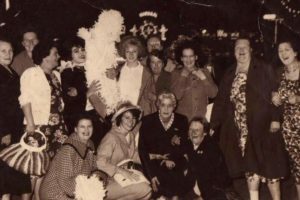 The West Silvertown ladies staged their Beano from the sadly lost Jubilee Tavern pub, Silvertown. Jubilee landlady Hannah Bowden and her married daughter Phyllis Newell who lived within the pub at that time and whose husband Reg served behind the bar. 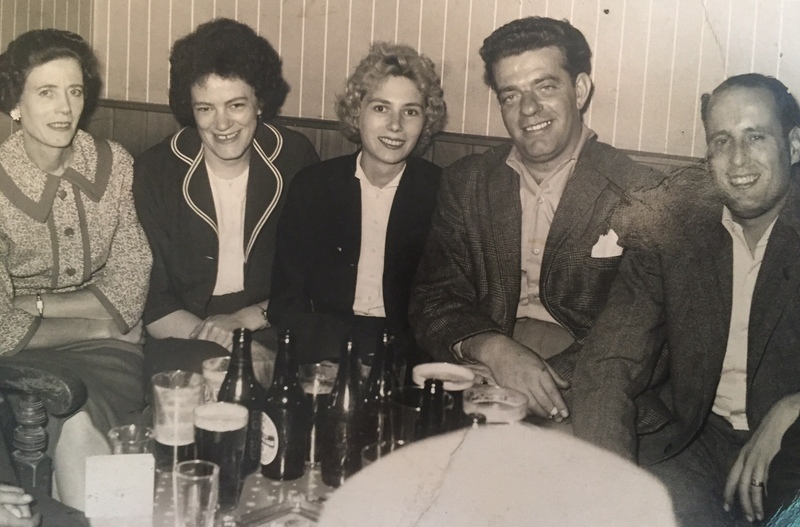 I have also unearthed from the Grainger and Quirk family archives, pictures of beanos for both men and women from Canning Town and North Woolwich in the 50s and 60s. 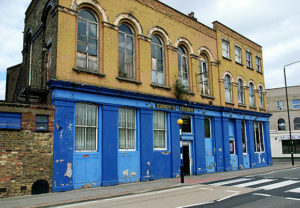 The Connaught Tavern is one of the few remaining pubs. It has been called The Fox@Connaught since 2003, but the inn dates from 1881 and is a Grade II listed building. The dockside Connaught Tavern originally opened to cater for passengers disembarking from craft berthing at the Victoria Docks. But as passenger numbers reduced the pub found itself catering more for the dock’s labourers and became a daily congregation point for those waiting to be picked for work. This historic building was designed and built by Victorian architects Vipers and Wagstaff and had a £250,000 refurbishment in 2003 to the upper floors to convert to a 17 en suite bedroom hotel with room service. There’s a Gastro Bar and restaurant on the ground floor. It served generations of dock workers and is famous for many years because the ‘Iron Lung’ stood outside. The Grade II listed Victorian cast iron urinal weighing over a tonne, was officially called The Rotunda. Used by generations of dock workers and pub goers, and got its title because of the appalling stench inside. The gentleman’s pissoir by CS McDowell is the only surviving circular public urinal in London, and was listed in 1983. After the closure of the docks in the 80s it gradually deteriorated and Newham Council eventually sold it off to the now defunct London Docklands Development Corporation for £1. The body received bids from many areas for the pissoir, including interest from the USA. Back in the 60s, 70s and 80s, many London buses and indeed London Bridge was sold to the States. But it was refurbished at a cost of £47,000 and is now in storage in a container in the docks. 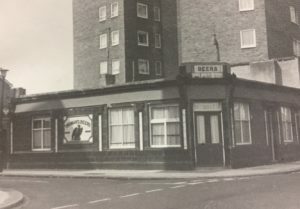 Local drinker David Conroy said that one of the pubs that is no longer with us is Cundy’s, or to give the official name, the Railway Tavern in Silvertown. “There is social history extraordinary in Cundy’s. It’s the pub that feature in the strike that shocked the Capital and helped launch the modern Labour movement, finally closing to the community in 2009, “ he said. David used to drink in the pub and the Royal Albert, another that was lost to E16 in 2003. In 1852 S.W.Silver and Co moved to Silvertown from Greenwich and established a rubber works, originally to make waterproof clothing. This developed into the works of the India Rubber, Gutta Percha and Telegraph Cable Company, which constructed and laid many submarine cables. In 1889 Silver’s factory was the scene of a 12-week-long strike by the majority of its 3,000 workers. The strikers were demanding higher pay and were inspired by the recent successes of New Unionism in the East End. Management refused to negotiate with the strikers who had immense popular support. Leading figures in the strike included Tom Mann and Eleanor Marx. The workers were eventually starved back to work, with many being victimised for their role. In the aftermath of the strike, Silver’s declared a half-yearly dividend of five percent. Silver’s management were congratulated by the rest of the industry for holding a line against New Unionism. The workers reaped few benefits from their work. Working girls at the factory received around ten shillings a week. Labouring men twice that, and the skilled workers twice that again. There was no fixed rate or established contract. Workers who worked 63 hours a week received no overtime. Girls who were idle due to machine failure lost pay until they resumed work. Labourers who worked on the yards and wharves had no shelter for meals or toilets. The decision to take strike action was inspired by the victory of the dockers and the other two famous East End victories of the match girls at Bryant and May’s and the Gasworkers’ strike in Beckton. After initially conceding an increase in pay to the yardmen, the boss, Christian Gray, cancelled it when other workers petitioned for a similar rise. The workers wanted sixpence an hour like the dockers and pay was less than fivepence for most labourers. Despite being defeated working class fighters made their mark. Strike leader Fred Laing, Will Thorne and Tom Mann and Eleanor Marx became key figures. Fast forward to later life, the pub hosted the Peacock Gym in the 1980s, but then went downhill until it closed. It is now flats. The Royal Oak in North Woolwich is remembered with great affection as a family and community pub. The Royal Oak, North Woolwich – in colour and mono! The Truman’s pub was built in 1872 and boasted some very fine Truman’s tiled signage, which are amazingly still visible today. Wartime bombing resulted in the loss of the upper floors but it carried on as a single storey pub, later completely surrounded by redevelopment. The Woodman Street pub was packed with dockers during the lunch breaks. Pamela Wellman and husband Stan ran the pub for 20 years from 1972. “I could still tell you all the regulars names. It was the centre of that little community. We had lots of laughs and staged many charity nights – one was based on the Sale of the Century TV programme. The money raised provided parcels for pensioners at Christmas. The pub changed hands twice more after Pam and Stan left in 1992, finally closing in 2010. By no means comprehensive, among the pubs to close since 1944 are: The Albion, Anchor; Artful Dodger, Barge, Barge House, Bell and Anchor, Bridge House, Britannia, British Flag, Callifornia, Central Buffet, Chandelier, City Arms, Dartmouth, Duke of Cambridge, Durham Arms, Essex Arms, Flying Scud, Gallions, General Grant/Gordon/Roundhouse, Graving Dock, Ground Rent, Hallsville, Hernsworth, Huntingon, Jubilee, Kent Arms/Jimmy Deans/Churchills, Lads of the Village, Lilverpool Arms, Lord Nelson, Mariners Arms, Marquis of Salisbury, New Gog, Nottingham Arms, Ordnance Arms, Paul’s Head, Peacock, Pitts Head, Prince Albert, Prince Arthur , Railway Hotel/Cundy’s, Royal Albert, Royal Oaks (North Woolwich and Canning Town), Royal Pavilion, Rose of Denmark, Shakespeare’s Head, Spanish Steps, Telegraph Arms, Three Crowns, The Woodman, Tidal Basin Tavern, Victoria Tavern, Windsor Castle. And with almost magical timing, our story may have a happier ending…it has been revealed that new pubs are on the way. A Fuller’s pub will be the latest addition to the Royal Wharf development in West Silvertown. The 7,000 square foot bar will open later this year, with a 2,000 sq ft area for outdoor dining on the riverside. Another bar to be built in North Woolwich – on the other side of the tracks to the Henley Arms. More details to come soon. And another application has gone to Newham Council for licensing and music and dance entertainment for the Lockside Kitchen and Bar in Aird Point in in Lockside Way, North Woolwich/Beckton, near the Gallions Point Marina. A shame that the future of the marina hangs in the balance thanks to the London Mayor approving the eviction of those who run the marina. 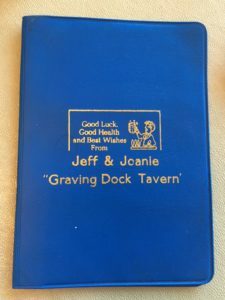 This article was written on 04 Apr 2018, and is filed under community, community spirit, Forgotten Stories, pubs, Royal Docks.